Affordable and Easy Houseplants to Grow and Keep those Winter Blues at Bay! Easy houseplants to grow that will brighten your home during the dark gloomy days of Winter. Maybe you’ve missed all the Christmas holiday greenery that has been stored away? And maybe your home feels a little bare without the Christmas decorations? Why not add a few houseplants to your home to replace the Christmas greenery. No need to do without the greenery in your home during the long Winter months. There are many houseplants that can bring fill your home with greenery and freshness. These are easy to maintain houseplants that will brighten your home and uplift your spirits. It has been thought for many years that plants in general reduce stress. And plants can help your overall well being. This year add houseplants to your home to help beat away those Winter Blues. 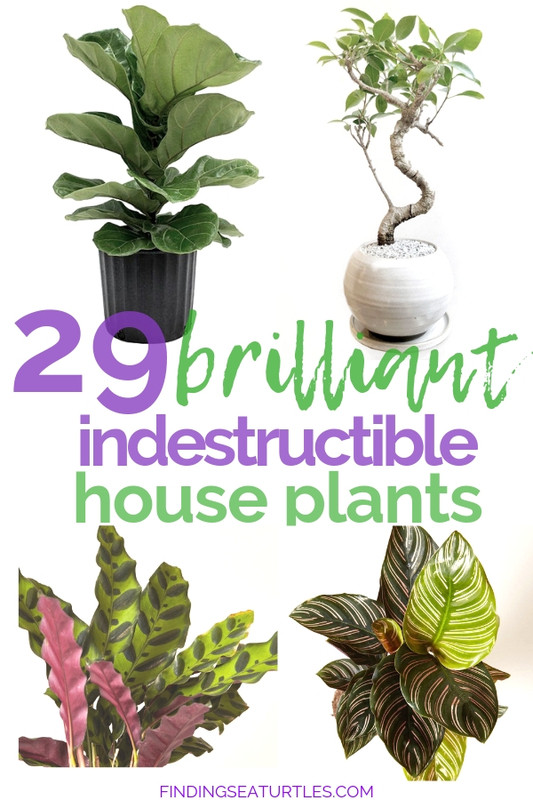 Amazingly easy to grow and care for, these houseplants are simply gorgeous! Celebrate the Winter season in your home by adding a few houseplants. We have rounded up 29 easy houseplants to make your home brighter and greener. Take a look at these houseplants. And be sure to let us know what you think. Begonia rex Jurassic Green Streak has large leaves with silvery white and accented with green. The leaf tips and main vein are dipped with blushed rosy pink. Striking beauty, fit for your home or office. Requires low light exposure. Grows between 10 to 16 inches tall. 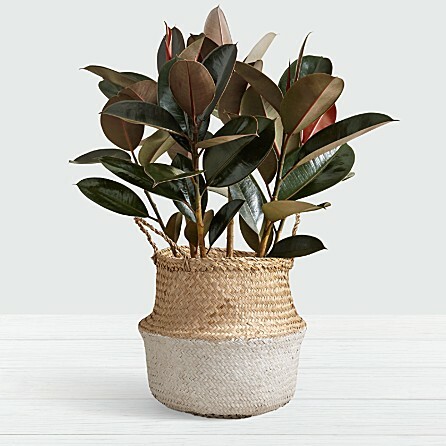 For a tropical look, the perfect plant is a Rubber Plant. 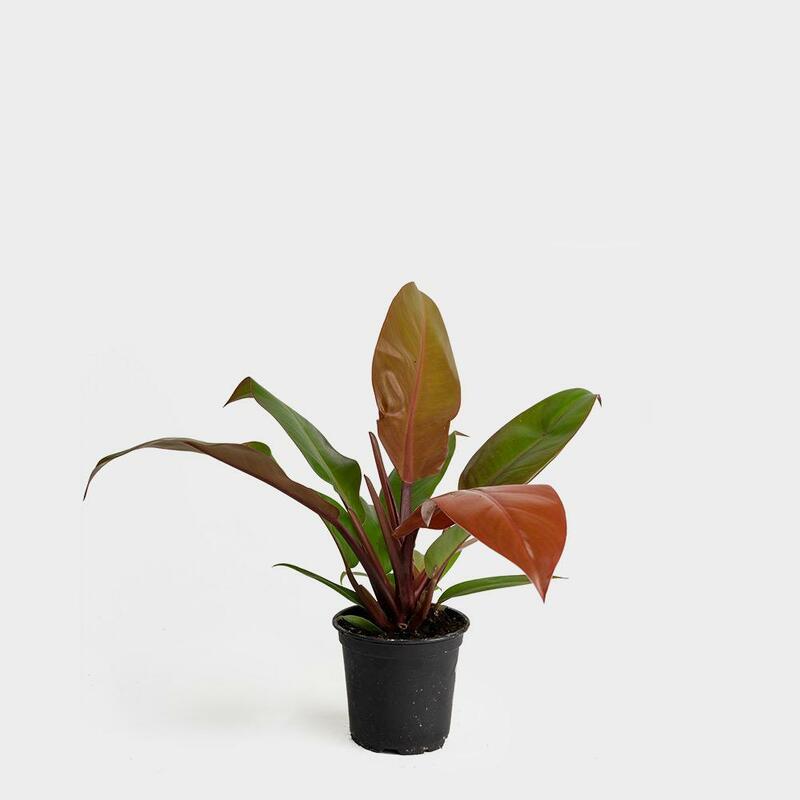 With its glossy, dark green leaves, the Rubber Plant is part of the Breathe Happier Collection. The hardy Rubber Plant is easy to care for. Standing tall at 28 inches, it helps to purify the air. Lovely and an easy houseplant for an office or study area. 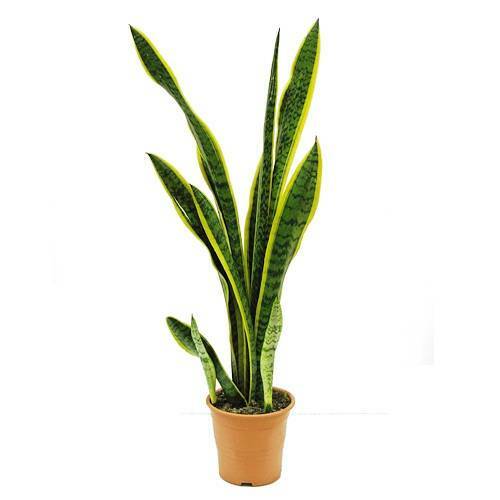 Snake Plant or Sansevieria trifasciata will thrive in either low or bright light exposure. Water lightly such as once every two to three weeks. With less watering over the Winter months. The Snake Plant is sometimes called Mother-in-law’s tongue. A hard working Snake Plant that filters the air. 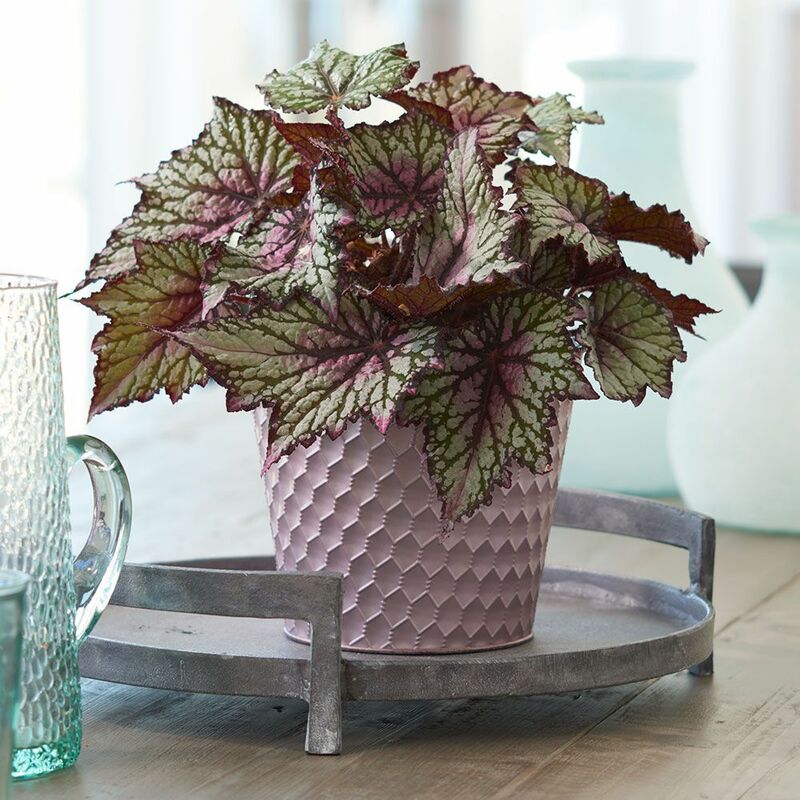 Add dramatic color to your home with this houseplant. The added benefit is that it may even help you sleep better by breathing cleaner, oxygen-rich air at night. The leaves of the Philodendron Prince of Orange open with a starburst of yellow then turn to copper tones. Darker shades of green appear on the Prince of Orange as the leaves age. A low-humidity tolerant variety, Prince of Orange is perfect for a home or office. Prince of Orange likes bright light and more moist soil. Regular watering produces big-leaf growth. Just beautiful! Alocasia ‘Polly’ has deep green arrowhead or shield shaped foliage. The white veins provide high contrast to the Alocasia Polly. 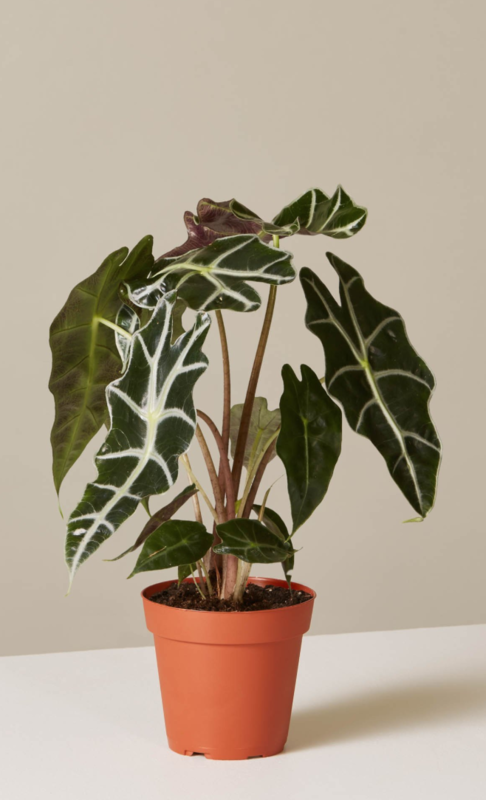 A striking and boldly beautiful houseplant, the Alocasia Polly likes medium light. Water weekly to keep this easy houseplant happy! Easy to grow Lemon Prayer Plant Maranta has big, oval leaves that turn upward in the evenings. The folding and unfolding of the Lemon Prayer leaves is cyclical. Give the Lemon Prayer Plant bright indirect light during the day. Water enough to keep the Lemon Prayer evenly moist. An easy houseplant to maintain! The lovely and wandering Angel Vine has delicate round shaped leaves. Grow Angel Vine indoors or in a sheltered outdoor setting. In an indoor setting keep Angel Vine under bright or direct sunlight at room temperature between 65-80 degrees F. Water Angel Vine to keep soil moist evenly. 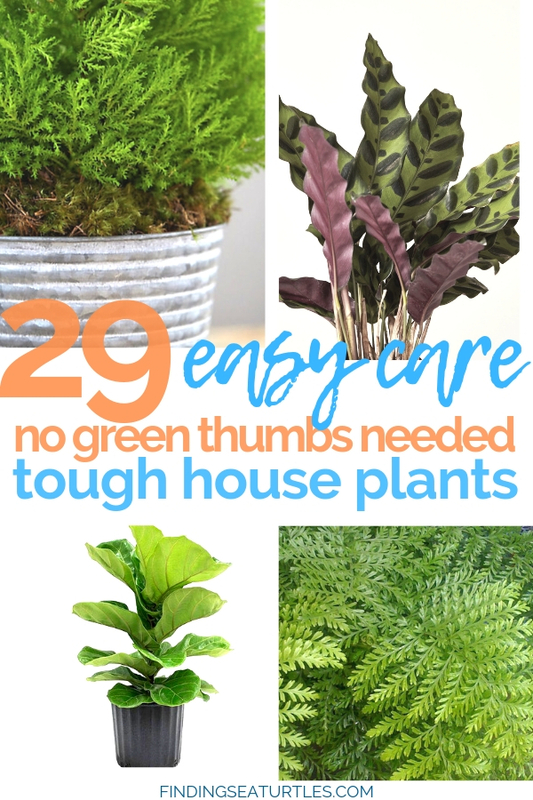 Temperature extremes, drafty areas, and vents should be avoided with this houseplant. 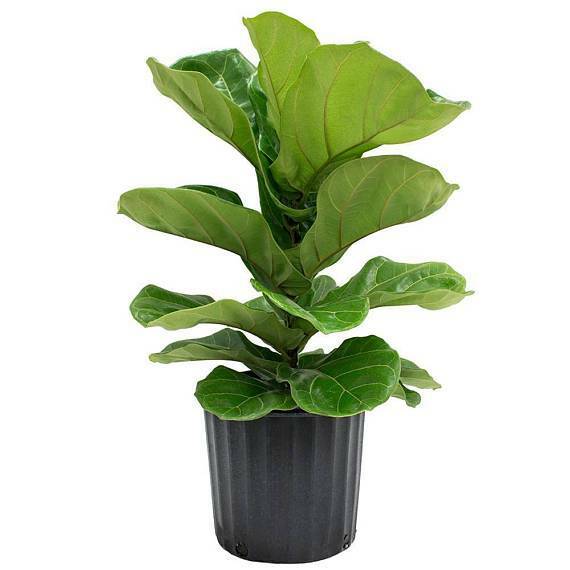 Fiddle Leaf Fig Tree or Ficus Lyrata has very large, heavily veined, violin-shaped leaves. The upright Fiddle Leaf Fig Tree can grow up to 6 feet or more. In its native habitat, Fiddle Leaf grows to 40 feet or more! A perfect indoor plant that helps clean the air. Asparagus Fern, sometimes called foxtail fern is a herbaceous perennial. 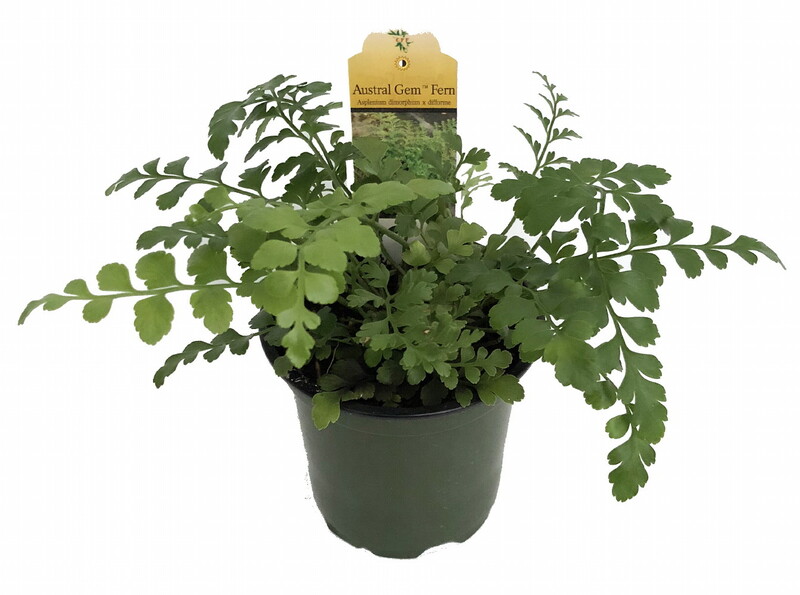 Usually grown indoors, the Asparagus Fern has lace-like foliage that is dense and bushy. It forms a mound or grows in an arching spike form. 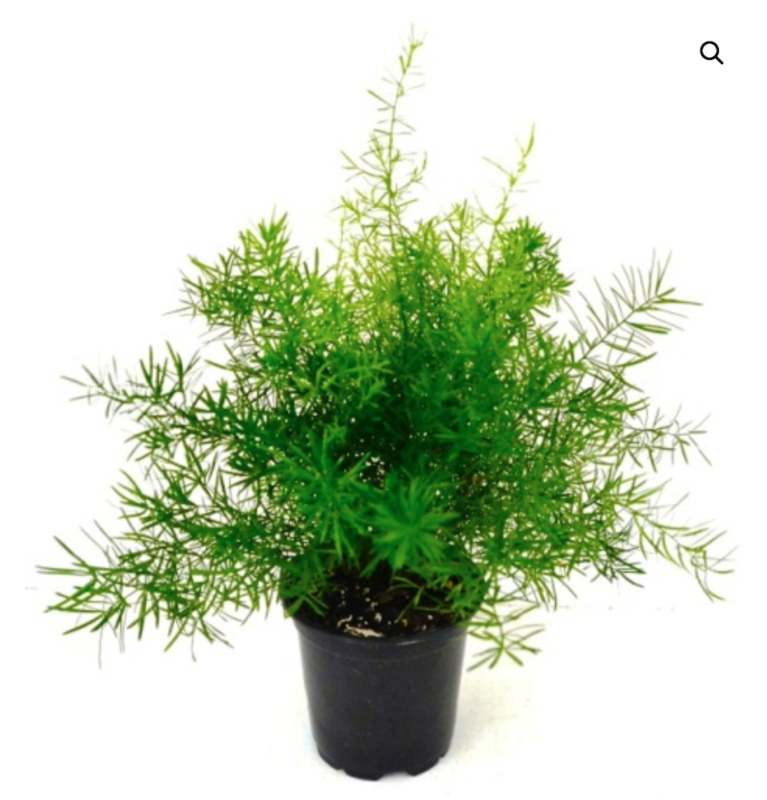 Easy to grow, the Asparagus Fern is actually not a fern. Happiest with bright, indirect light. Grows between 12 to 18 inches tall. 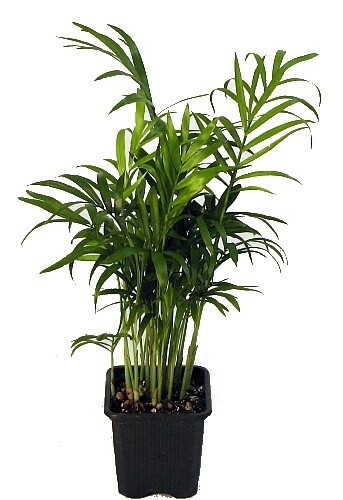 A beautiful lush green houseplant, perfect for your office or home. 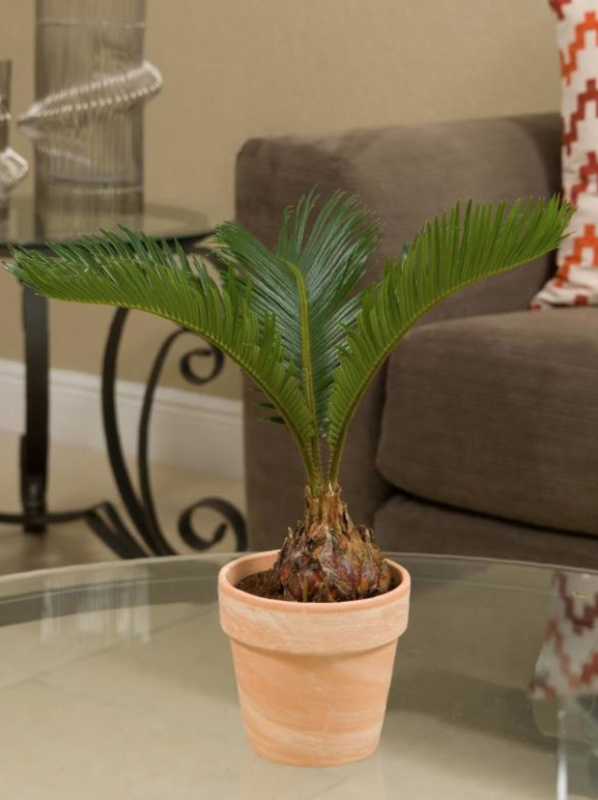 Easy Sago Palm has feathery dark green leaves over a swollen stem. A tropical plant, Sago Palm likes 3 to 4 hours of high, indirect light every day. Slow growing Sago Palm is low maintenance and long lasting. Stiff, spiny fronds resemble palm branches. Ideal for an office or any area where pets do not live. 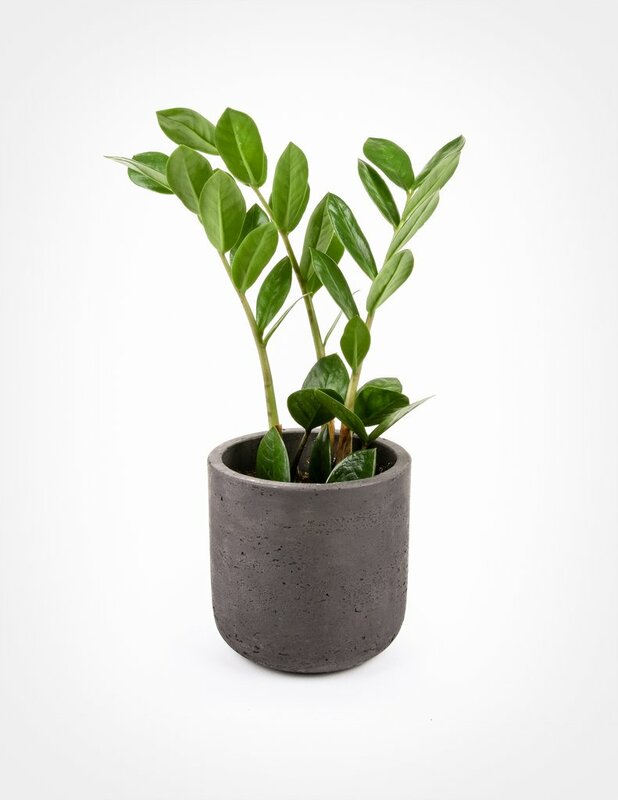 Zamioculcas Zamiifolia or the ZZ plant is a low maintenance houseplant. Has 3 feet long leaves from a large rhizome. The ZZ branches has between six to eight sets of waxy, glossy, deep green leaves. Tolerates low light and infrequent watering. Generally grown in containers, they like well drained soil. Water regularly but let soil dry out between waterings. Water less frequently over the Winter months. Keep indoors or bring inside when temperatures dip below 60 degrees F. Grows to about 2 feet tall and 1 to 2 feet wide. 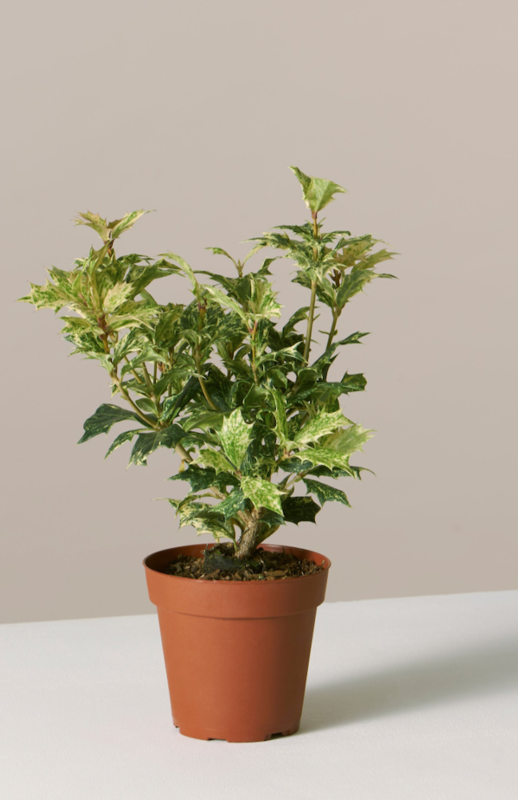 Olive Holly is a pet friendly houseplant. Give Olive Holly direct Sun indoors for most of the day. Water Olive Holly every 5 to 10 days. Likes temperatures below 75 degrees. Closer related to olive plant than to the holly, Olive Holly likes a normal to low humidity environment. Burgundy Ripple Peperomia are slow growing and compact. 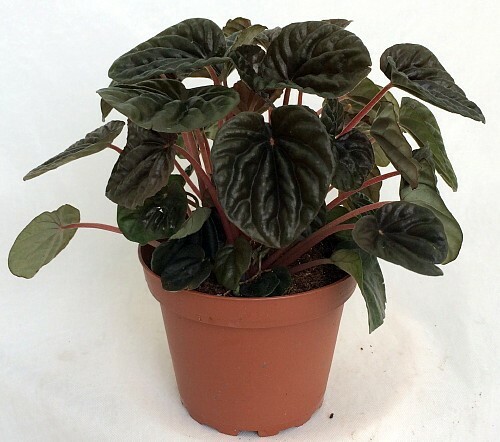 Likes bright, indirect light, the Burgundy Ripple Peperomia is an easy houseplant to grow. Water Burgundy Ripple Peperomia when dry. Philodendron Moonlight has nearly neon green leaves. 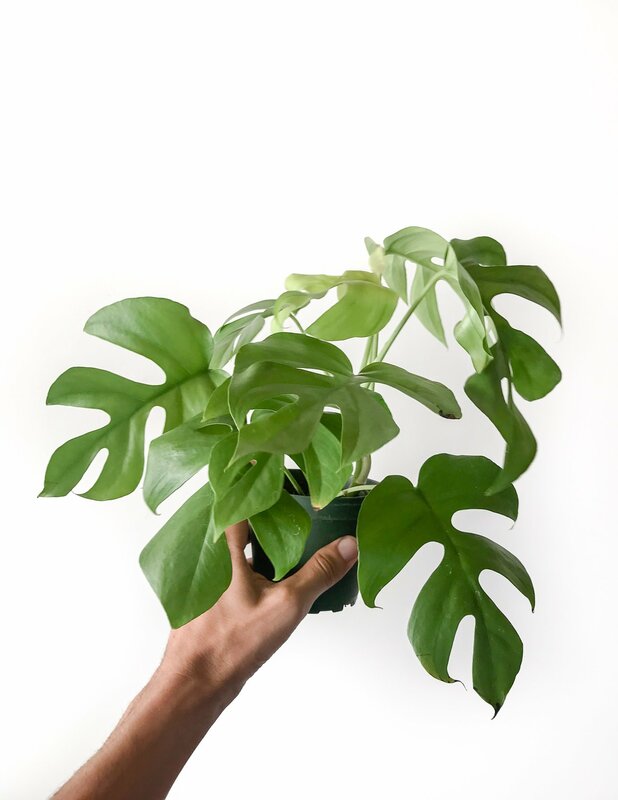 The perfect environment for the Philodendron Moonlight is one with medium light and weekly waterings. Tolerates any humidity level, the Philodendron Moonlight is stunning! 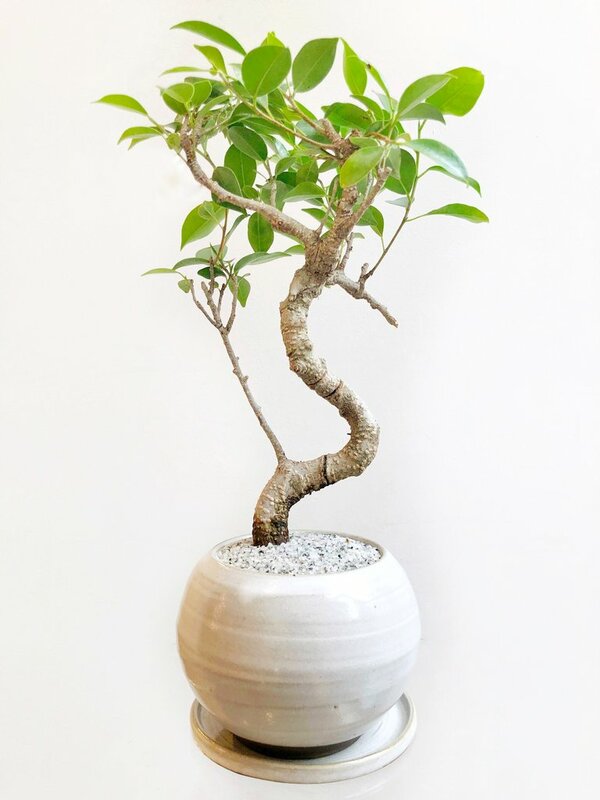 Considered the beginner’s Bonsai, Hal, the Chinese Banyan is native to Southeast Asia. Also referred to as a Ficus microcarpa. The Chinese Banyan tree is a symbol of longevity and immortality. Hardy and resilient, the Chinese Banyan not only survives but thrives in a wide range of indoor conditions. Keep Hal, the Chinese Banyan in temperatures between 55 to 80 degrees. Likes bright, indirect light. Water about once a week or when the container feels ½ lighter. As needed, submerge container in water up to the base of the trunk for 10 minutes. Afterwards, set container on a tray to drain excess water. 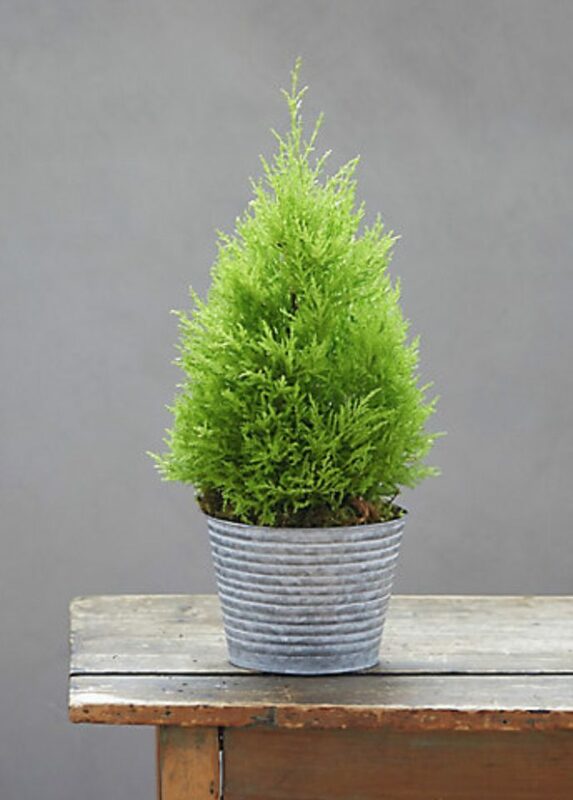 Fragrant Lemon Cypress Topiary can be grown indoor or in a sheltered outdoor area. Keep the Lemon Cypress indoors with bright or direct sunlight at room temperature between 65 and 80 degrees. Temperature extremes, drafts, or vents should be avoided. Keep the Lemon Cypress soil evenly moist by watering thoroughly. Allow excess water to drain before returning to the outer pot. An easy houseplant, Kimberly Queen Fern is thought to be the most beautiful fern. Ideal for patios, office space, or indoors. Kimberly Queen Fern has large fronds, upright bushy and sword-shaped leaves. Grows to 30 inches at maturity. 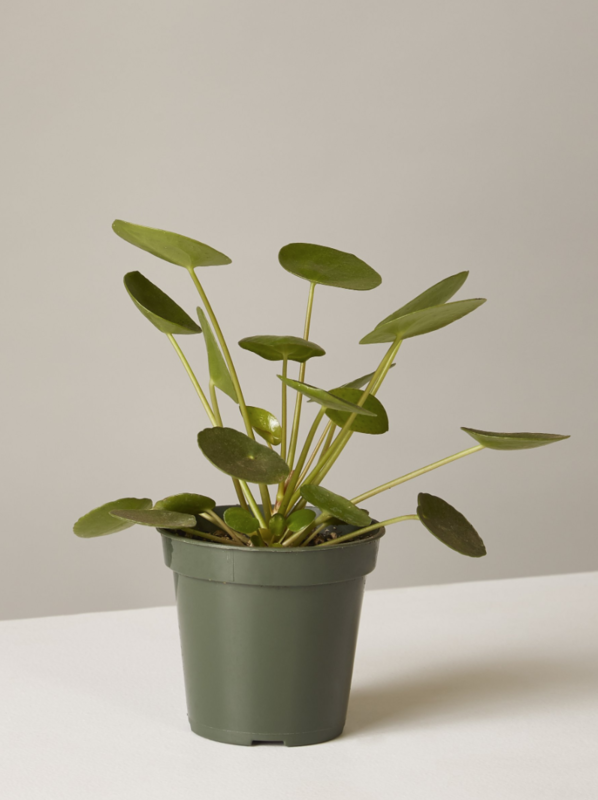 Pet-friendly Pilea Peperomioides has coin-shaped leaves. A recent entry commercially, Pilea Peperomioides likes bright, indirect light to dappled Sun. Allow soil to dry out completely between waterings. Pilea Peperomioides likes normal to higher humidity. The Austral Gem Fern or Asplenium dimorphum has dark green foliage. Sometimes referred to as the Birds Nest Fern. Unique to most ferns it has stiff, shiny leaves with a waxy texture. 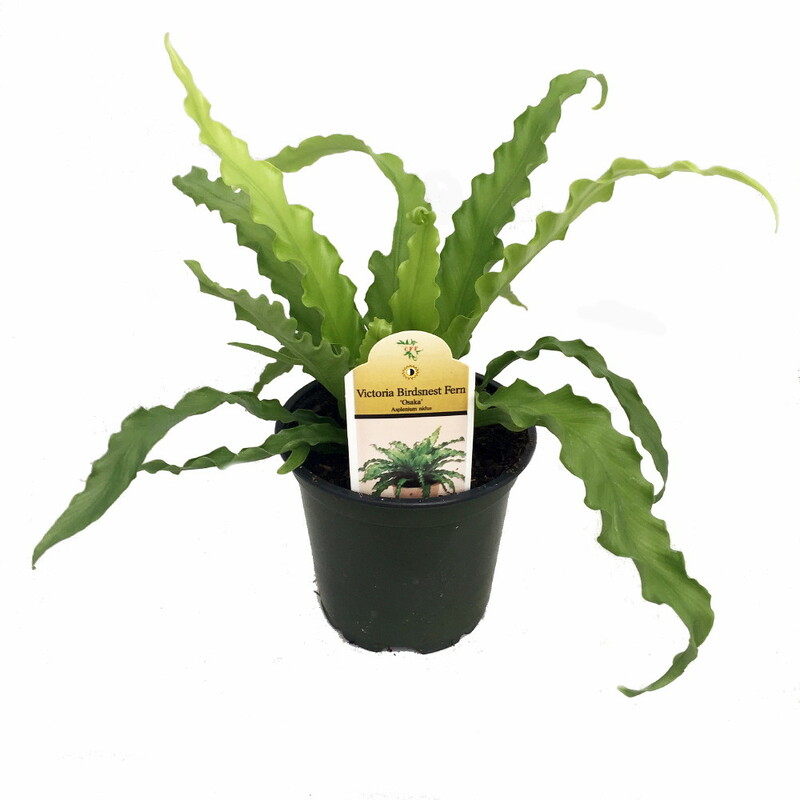 A moderately slow grower, the Austral Gem Fern is drought tolerant. And prefers evenly moist soil and indirect light. 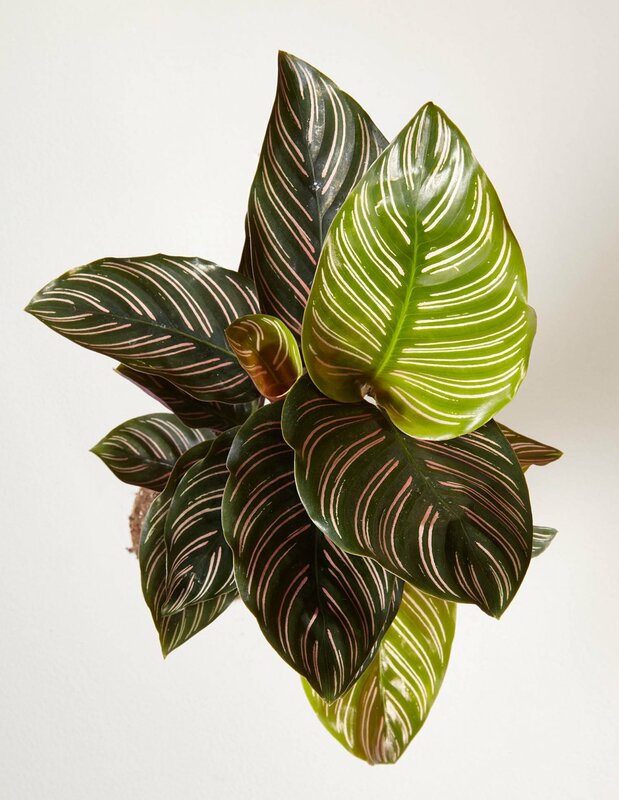 Calathea Rattlesnake has long, wavy green leaves. The leaves have a pattern of deep green brushstrokes with a purple underside. Frequently called prayer plants because their leaves close in the evening. Pet friendly Calathea Rattlesnake likes medium indirect light to dappled Sun. 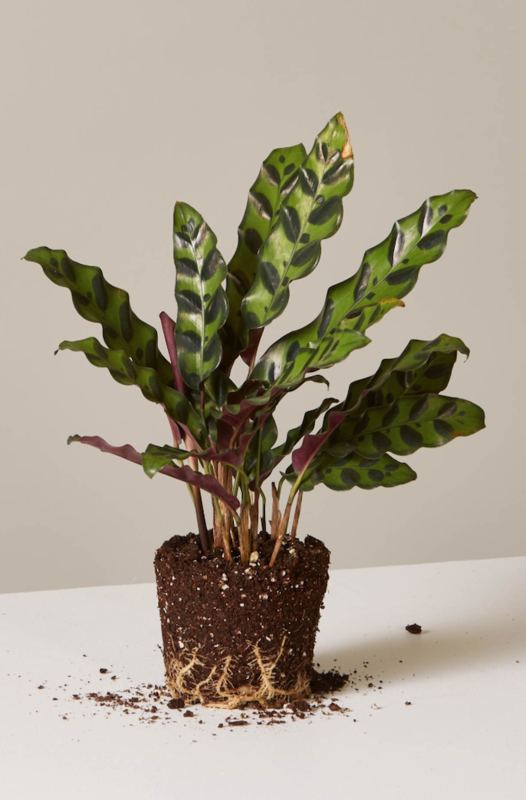 Water Calathea Rattlesnake when the soil is half-dry to dry from the top 2 inches to below the soil level. Likes normal to slightly humid environment. The Staghorn Fern or Platycerium bifurcatum has elongated forked fronds that resemble antlers. Also known as the Elkhorn Fern, the Fern grows shield fronds. Round, plate like leaves that dry to form a protective layer around the plant’s roots. An epiphyte that grows on other plants or trees, the Staghorn Fern is often mounted. An excellent houseplant that thrives in small spaces. 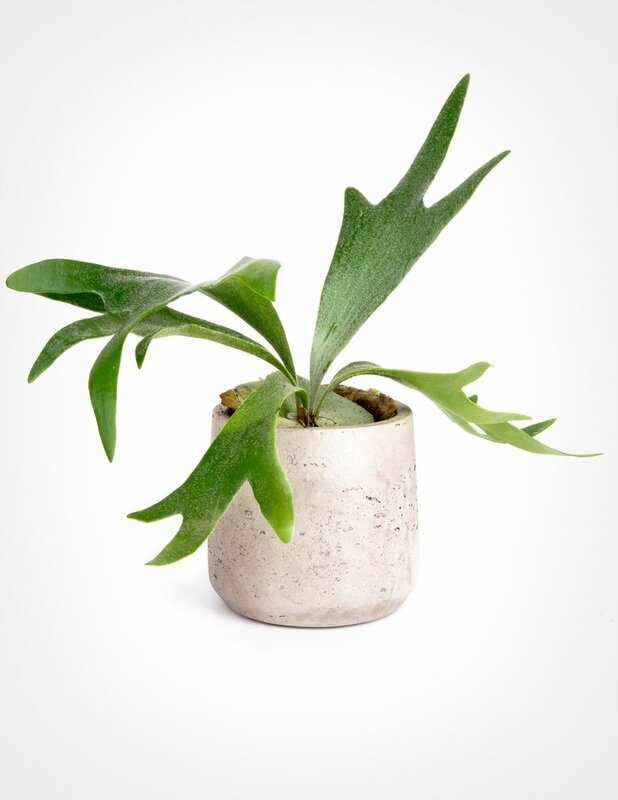 Staghorn Fern requires bright, indirect light with good drainage. 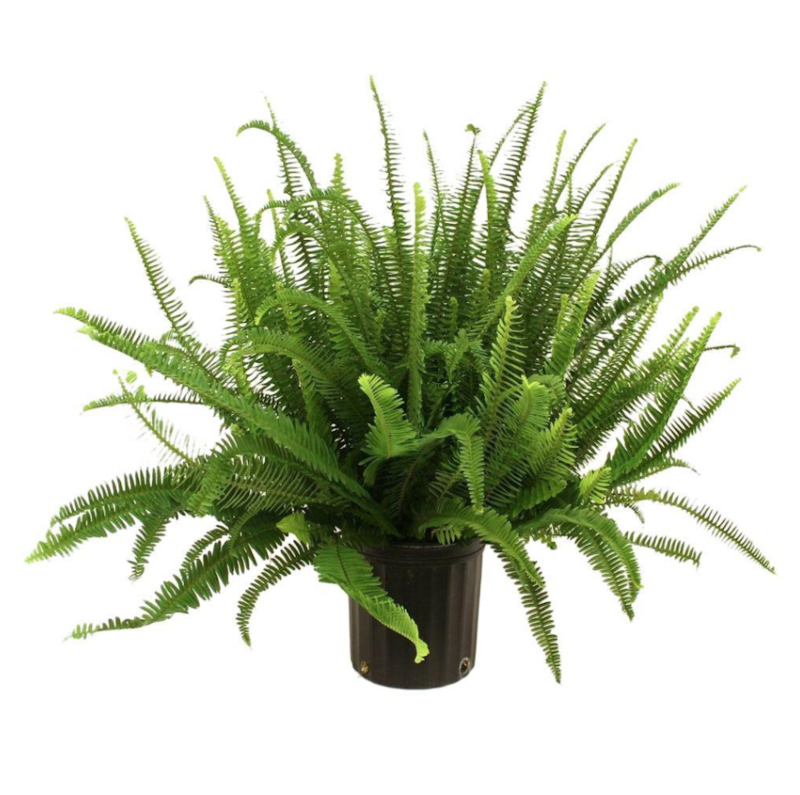 Mist regularly to promote a humid environment for the fern. 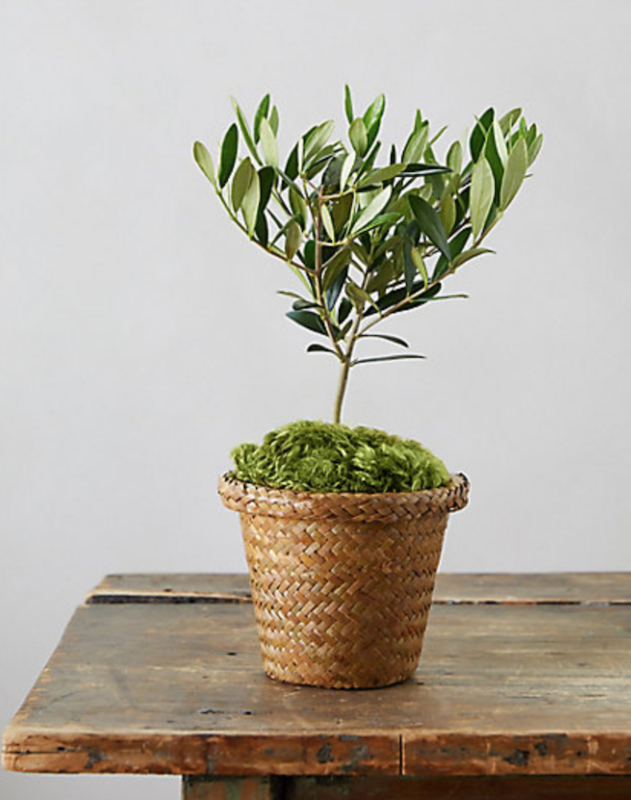 A touch of the Tuscany countryside, the Olive Tree can be grown indoors or outdoors in a protected area. Keep an indoor Olive Tree with bright or direct sunlight. Grow in room temperatures between 65 to 80 degrees. Temperature extremes, drafts, and vents should be avoided. Water the Olive Tree thoroughly when soil is dry to the touch. Allow excess water to drain before replacing in cache pot. A fast growing vining plant, the Raphidophora tetrasperma has unique leaves. Called “Dwarf Monstera” or “Monstera Ginny” because it resembles Monstera deliciosa. The leaves of the Raphidophora tetrasperma are split with “windows” but stay small. Easy to care for, the Raphidophora loves to climb a moss pole. Easy to propagate from stem tip cuttings. Thrives in bright indirect light. Victoria Bird’s Nest Fern or Asplenium is native to tropical Asia. Also called the Japanese Bird’s Nest fern, it has apple green fronds. Fronds reach up to 20 to 60 inches long by 8 inches wide. As the fronds mature, a midrib appears in blackish color. Showy and dramatic. Keep moist at all times with the exception of Winter. 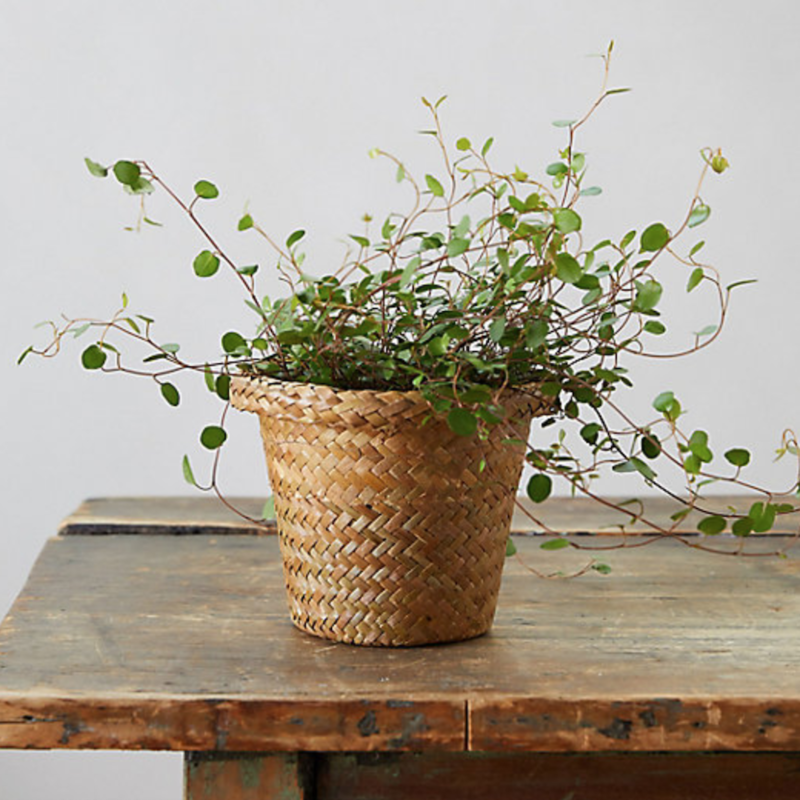 A stunning houseplant for home or the office. 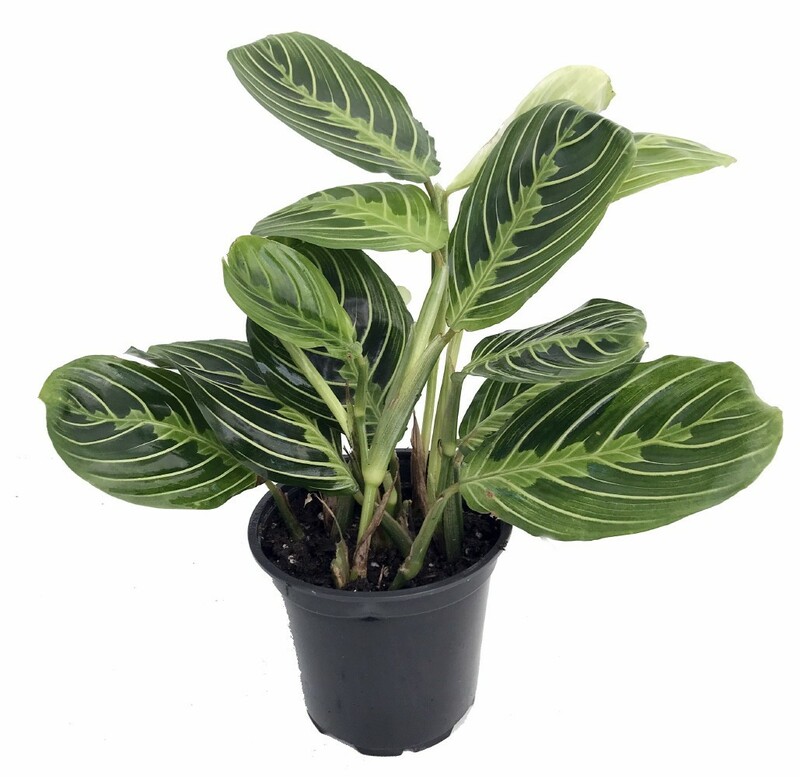 Pet friendly Calathea Pinstripe has ornate painterly patterned leaves. Thrives in medium indirect light to dappled Sun. Keep away from intense, direct Sun. Water weekly when soil is half dry to dry. 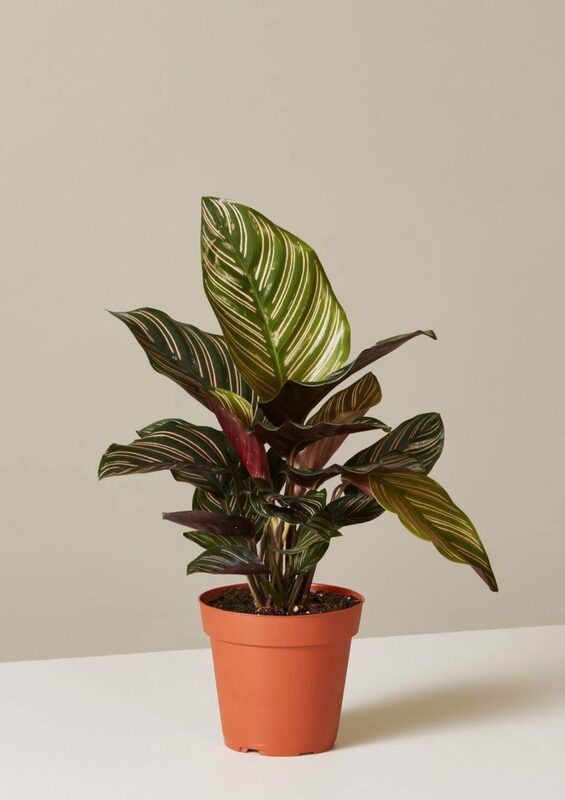 The Calathea Pinstripe likes normal to slightly higher humidity. Because of its ability to come back to life – this houseplant is named as such the Resurrection Plant. 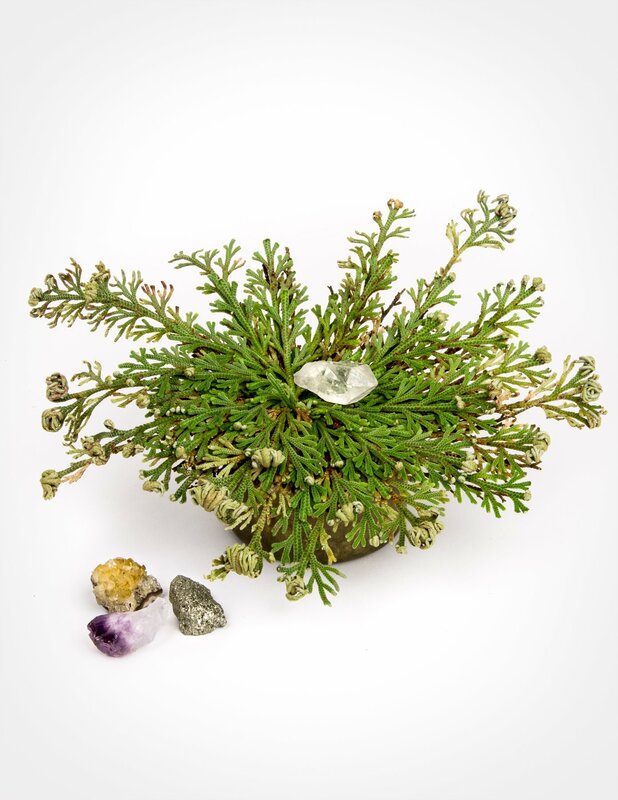 Resurrection Plant is known as Selaginella lepidophylla and the “Rose of Jericho”. Tough Resurrection Plant has little tumbleweed curls that tighten into a ball during dry periods. The balls unfurl into lacy, deep green fronds when exposed to moisture afterwards. It comes back to life again and again. 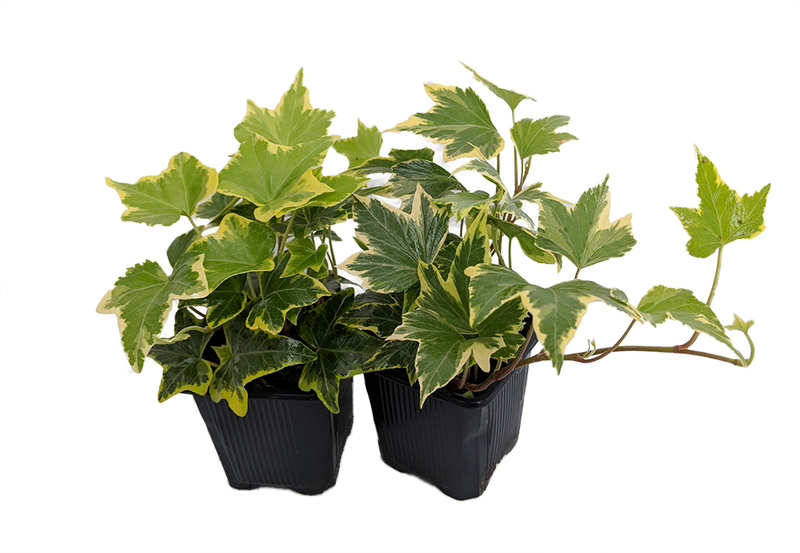 Hedera helix ‘Gold Child’ English Ivy has variegated leaves with a lobed, ivy shape and a heart-shaped base. Leaves are gray-green with irregular, wide with gold, green margins. The variegation turns creamy white in hot weather. As the ivy matures, it becomes bushier with sharper, triangular leaves with no lobes. Perfect for containers and hanging baskets. A vigorous and easy to grow ivy. The Victorian Parlor Palm or Chamaedorea is adaptable to a variety of environments. Use in an office, conservatory, or in your home. Also called a Table palm, the Victorian Parlor Palm is hardy and tough. 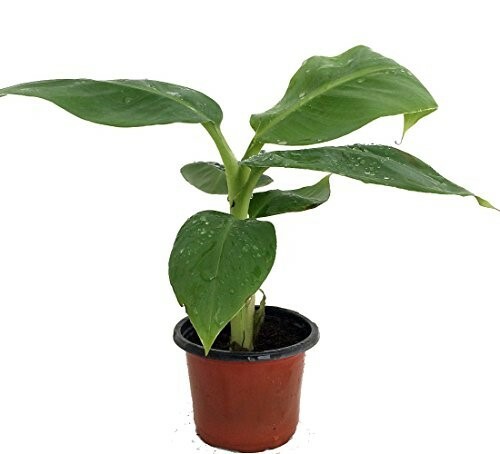 Truly Tiny Banana Plant or Musa is a miniature version of the Dwarf Cavendish Banana. Grows up to 24 inches tall. Produces great tasting bananas. Easy to grow indoors and outdoors. 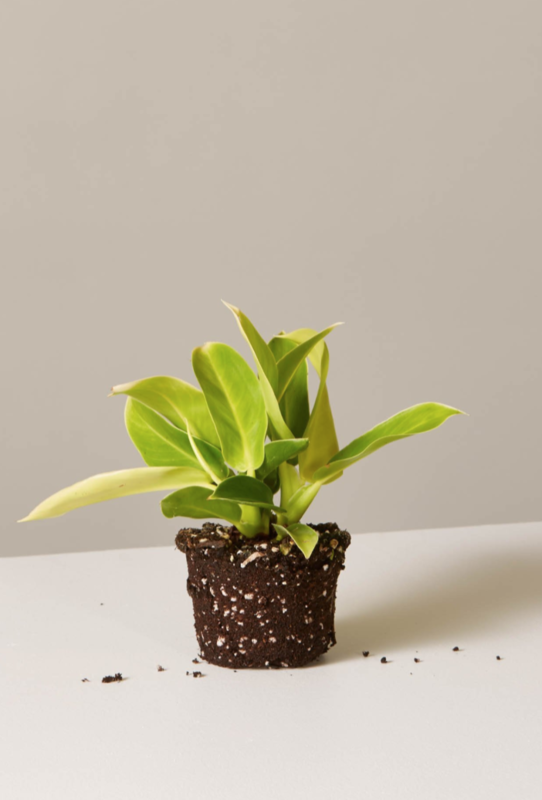 Makes a great house or patio plant, Truly Tiny is just so cute! These are 29 Easy Houseplants to Beat the Winter Blues and brighten your home or office space. Brighten your space with any of these houseplants. If you try any of these 29 Easy Houseplants let us know how you make out. If you have any questions, feel free to reach out to us in the comments below. We always are ready to help you out. Thanks for dropping by.